Trust, to call the Americas sacred is a struggle. To reside in this hemisphere is to stand atop a litany of violences: the genocide of indigenous peoples, the enslavement of Africans, the indentured servitude of South Asians, the debt traps forced upon smaller economies, the redlined districts, the lead in the water, the deportations, the prisons for profit. When the list stretches long, how dare I say “sacred”? How is this land not a haunting, a doomed procession of ghosts? These days we’re an apocalyptic bunch. With the global rise of the right and the curtailing of civil rights, we are quick to say that the world is ending. What we forget is that for so many peoples the world has already ended, many times over. We forget Sun Ra’s eerie refrain, “It’s after the end of the world. Don’t you know that yet?” And don’t you know that the world has been remade, again and again? This remaking is what I call the sacred. Our demand for life and humanity even while we are coerced into beasts and objects. Many of us have leaned into the divine in order to recreate our worlds. We’ve carried visions of Ogun across the ocean, and when denied land, we’ve built a Hindu temple in the sea. To be clear, my intention is not to fetishize survival and resilience. There are those who did not and will not survive. Still, it is important to recognize the psycho-spiritual labors of our ancestors and contemporaries. As a Trinidadian-born writer who grew up among various manifestations of Christianity, Hinduism, Islam and Ifá, I have a deep reverence for literary expressions that contend with the role of the divine in our human domain. In our current political and poetic moment, it often seems as if such writing is dismissed as apolitical or lacking in urgency, especially by those who are not well-versed in the symbols of the spirit, and its role in resistance movements and revolutions around the globe. Thus, Sacred Americas is both a celebration and interrogation of how the sacred weaves into the secular, the ways in which it can invent our political and social selves. These poems, stories and essays journey with the spirit in myriad ways, some questioning its impact and existence, others revering its presence in the folds and pockets of our living. Within this folio you will encounter: An impassioned call for Puerto Rico’s independence from the United States. A lament for the young lives snuffed out by police brutality, and the lives made small by the threat of state violence and surveillance. Meditations on migration, and how we make and remake home, whether in Cairo or an Indian bridal shop in New Jersey. And there is more. Desiree C. Bailey is the author of the fiction chapbook In Dirt or Saltwater (O’Clock Press, 2016). Her poetry and fiction has been published in Best American Poetry, Callaloo, The Rumpus and Transition, among other publications. She has a BA from Georgetown University and an MFA from Brown University. 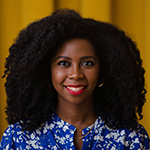 She has received fellowships from the New York State Council on the Arts/New York Foundation for the Arts, Poets House, The Norman Mailer Center, Callaloo Creative Writing Workshop, Kimbilio and Princeton in Africa. Desiree was born in Trinidad and Tobago and lives in New York.